"Who are we here to represent?" Actually, the fact that I didn’t go any further than calling him useless was my being nice. If I said what I really felt about Sen. Reid, then you could call me mean. In fact, you could feasibly ask me if I kissed my late Mother with that mouth…. But let me explain why I think that Sen. Harry Reid is about as useful as a tub of jello…and why I think I may have insulted jello by saying that. Sen. Harry Reid is the single most useless man in America because he had a public mandate to get something done about a very important issue concerning Americans and even with a majority in his house of Congress, he managed to get rolled by a special interest group. Granted, the National Rifle Association is not your average interest group. It’s a big group with lots of supporters, some of whom supported what it was you were assigned to do. But when you allow folks like Kentucky Sen. Mitch McConnell to keep you from restoring something to the Senate that it had before you took over—the concept of majority rule—you deserve a heaping helping of my contempt. While many of us were missing Soledad O’Brien as we watched CNN prove through its coverage of the Boston Marathon bombings that it’s better to be last and right than first and wrong, Congress was debating a bipartisan bill that if passed would expand universal background checks to cover gun show and internet purchases, but not purchases made between relatives. The compromise was brokered by two guys who had A ratings from the National Rifle Association, West Virginia Sen. Joe Manchin and Pennsylvania Sen. Pat Toomey. This bit of Democratic (Manchin) and Republican (Toomey) partnership was designed to help the bill get one step closer to President Barack Obama’s desk and make families who had lost loved ones in mass shootings in Colorado, Wisconsin, Arizona and Connecticut and to urban street violence in Chicago feel like their loved ones deaths had counted for something. In fact, I thought that the Sandy Hook shootings in Connecticut would put background checks over the hump. Now let’s keep it real here: When 21 white kids get shot by an assault rifle-wielding nut job in their elementary school, that tends to lead to something getting done. I’m not being racist here, something that I need to say because some white person will swear that what I just said was racist, but ask yourself: were we having a conversation about gun control or background checks when the kids being slaughtered on the streets were Black and Latino and the streets they were being slaughtered on were city streets? No. But when it’s an issue to White, suburban families, politicians generally run over themselves to be the first to solve the problem. Hell, to make sure that something came out of this, the NRA was even invited to the table by Vice President Joe Biden and Senators Manchin and Toomey to put in its two cents. But while the NRA was at the table, it was also whispering in the ears of the Senators it supports, telling them to vote no on the bill. And they listened. By a vote of 54-46, the bill strengthening background checks was defeated. The NRA, of course, was happy. Thanks to their efforts, the Second Amendment stands to take over the rest of the Constitution. As the document’s Third Rail, you’re not supposed to even think about, well, keeping some people and a firearm from ever getting together because gun-rights folks will have a full-on, paranoid freak-out if you even look like you’re going to put the words commonsense, gun, and legislation into the same sentence. They swear that asking for such things as making sure that you’re not allowing a murderer or a person prone to domestic violence through a background check is a slippery slope that will lead to nationwide gun registration, the government confiscating all of the guns from so-called “law abiding” gun owners, and the inevitable black helicopters of the New World Order coming to call.. 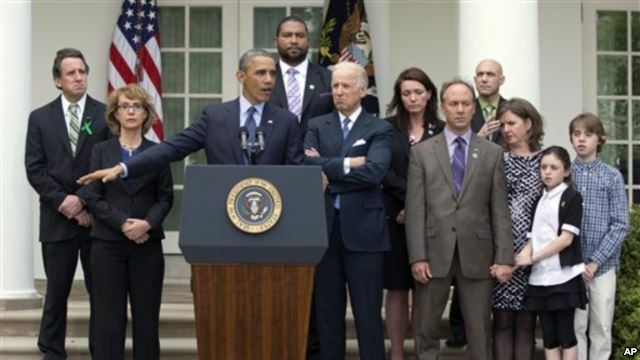 But President Obama, Vice President Biden and a group of parents including some from Sandy Hook and victims of gun violence like former Rep. Gabrielle Giffords, who left her dream job in public service after being shot in the head during a “Meet Your Representative” gathering, were less than amused with the Senate because of this. A member of one of the Sandy Hook families shouted “Shame on You!” in the Senate Chambers. At a press conference in the White House Rose Garden afterward, Obama, well, let the Senate have it. Calling it “a shameful day for Washington”, a town that’s had so many of them it’s hard to keep count, Obama asked out loud what many citizens were thinking after the vote. They weren’t representing those folks who say that closing the gun show and Internet gun sales loopholes makes sense. And they weren’t representing those who believe that America is awash in guns and large ammunition clips designed to do nothing but kill. The next thing that the Senate did, pass an amendment punishing states that publish information about gun owners, tells you who they represent. The Senate, and by extension Congress, represents the NRA. Which goes back to my friend Sen. Reid. 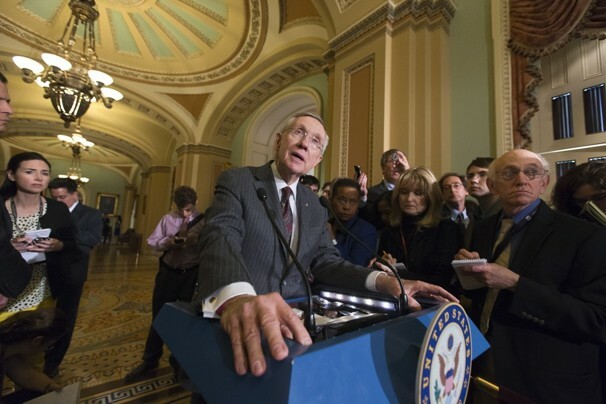 Before Sen. Reid became Senate Majority Leader, you could pass most things in the Senate with a simple majority vote. There were some things that required 60 votes to stop a filibuster and end debate, but most things were majority rules. But, as they are wont to do, the Republicans began abusing the filibuster rule. Now just about anything of any consequence requires a 60-vote cushion to even be discussed. Since Sen. Reid can’t always count on his majority to hold, certain things end up either not passing or twisting in the wind. Sen. Reid promised that in a second Obama Administration term, he’d reform the filibuster rules so that majority would rule when it could, and 60 votes would go back to being the gold standard, not the “we’re gonna use it to obstruct” standard. But instead of true reform, he caved in to McConnell and didn’t go nearly as far as he should have. Thus, you can have a majority of the Senate want to see something pass, and instead have it fail. And with that, Sen. Harry Reid becomes more useless than jello. My hope is that this defeat makes President Obama do something that he was kind enough not to do during his first term… decide that it might be time for a vote of “no confidence” for Harry Reid as Senate Majority Leader.